The anticipated decline in this bank's dividend shouldn't concern long-term investors. Speculation about Hudson City Bancorp's (Nasdaq: HCBK) dividend-paying ability is keeping many investors on edge. 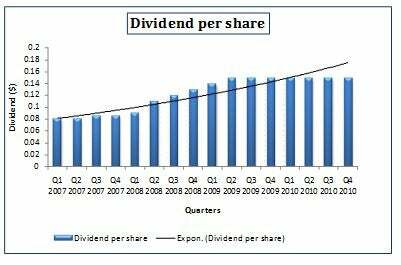 With a current yield of 6.3%, Hudson's had a history of consistent dividend growth and handsome yields. However, analysts now categorize the stock as a greater risk, especially after the company's CEO may have hinted at slashing the dividend. In my previous look at the bank, I had discussed the probability that recent restructuring charges might end its 11 straight years of profitability. But I would like to reiterate that a charge due to a balance sheet overhaul is a one-time expense, unlikely to affect long-term operations. For investors sitting in the stock today, I think it's important to dig deeper when judging its capacity to pay dividends. Over the past 16 quarters, the company has paid steady dividends to its investors without interruption. In addition, the cash dividends paid per common share have been growing steadily year over year, although they've flattened off a bit over the past couple of years. Of course, four years is not a long history to look at, but considering the timing of those four years -- you know, the whole "worst recession since the Depression" thing? -- it's definitely a significant period to maintain one's dividend. The chart above indicates to me that any cut or suspension that might occur will be followed by a reversion to past habits. As far as affordability goes, Hudson's payout ratio -- the portion of its net income that it pays out in dividends -- has been fluctuating at around a decent 50% in the past five years. Anything less than 70% or so is pretty much fine by me. On the face of it, considering the short-term possibility of a cut, regional rivals like People's United Financial (Nasdaq: PBCT) and Flagstar Bancorp (NYSE: FBC) may look like attractive alternatives to Hudson. But don't be fooled. At 257%, People's United's current dividend payout ratio is over and above its net income, which means that unless net income skyrockets this year, it will be paying out of its coffers to maintain the program. Flagstar has had trouble generating earnings over the past several years, and suffered additional real estate losses over the past year. To Hudson's favor, it has an ample and ever-growing hoard of available cash. This means that even if it incurs net losses in the first few quarters of 2011, it can still afford to pay dividends if it wants to. In the short-term, leaders at Hudson might just think it prudent to slash the dividend and focus more on restructuring efforts and future growth, rather than pleasing investors. Given the bank's remarkable performance thus far, I think they might deserve that freedom. Since Hudson has endured the financial crisis without the support of any bailout, I don't see why its performance should take a beating when things look brighter, apart from a few short-lived stumbling blocks that may come in its path. To stay up-to-speed on the top commentary and analysis, click here to add Hudson City to your stock watchlist.